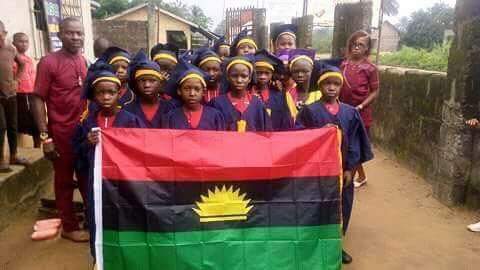 We the indigenous people of Biafra (IPOB) and it's leadership worldwide under the command of Mazi Nnamdi Kanu wish to inform Biafrans across the length and breadth of Biafraland to return our children back to school from Monday October 16, 2017. This directive is important because we have determined that for the time being, men of the Nigerian Army responsible for the murderous outrage of forcible vaccinations of our children has been withdrawn from our schools and banned from continuing with this criminal exercise. We want to use this opportunity to inform parents and guardians, particularly those in Anambra State, to return their children back to school on Monday 16th of October 2017. Right now, IPOB have ascertained that Nigerian soldiers have withdrawn the vaccination program. IPOB will continue to monitor the situation in schools in and around Biafraland and particularly Anambra State until this evil plot by the APC Nigerian government and their accomplices in Igbo land like Gov. Willie Obiano, is totally terminated by Nigerian Army HQ. Our early warning team is in place all over Anambra State and should anything untoward be spotted on Monday morning or Nigerian Army vehicles found anywhere near any school, IPOB would raise the alarm immediately to recall our children as was the case last week Thursday. We are determined to ensure the safety and well being of our children and under no circumstance will we allow them to be poisoned with killer virus administered by those that want all Biafrans dead. The plan of Willie Obiano and corrupt Igbo governors, including political contractors in Abuja to sacrifice the lives of our children to please their fellow blood thirsty Hausa Fulani Islamic caliphate in Arewa North for the sake of second term in office or political position, will not be allowed. At IPOB, our children are important to us, after all we are sacrificing our lives on a daily basis in pursuit of Biafra that we may give them a future to be proud of.